Nike is showing some signs of progress toward accelerating sales growth and margins, Wedbush Analyst Christopher Svezia says. Svezia believes the company’s financials will improve on the back of less FX pressure, a higher average selling price, and new product releases. 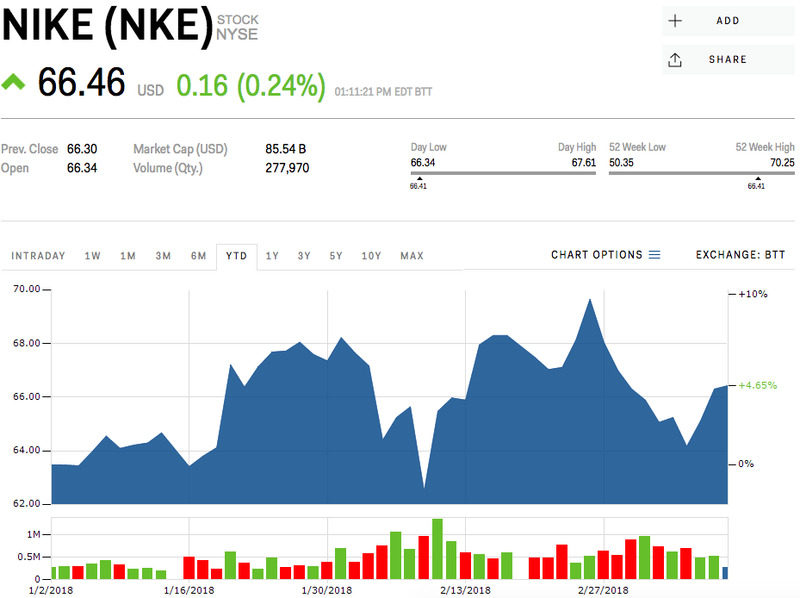 Watch Nike’s stock price move in real time here. While some industry sceptics see the reversal of Nike’s lagging North American sales coming too little, too late, one Wall Street analyst believes it has reached an inflection point and will be seeing more upside in the future. The sneaker giant has lost market share to rivals like Adidas because it has been slow to pick up on trends and deliver hip products in a timely fashion. However, that is starting to change as the company has begun to roll out new styles, colours, and product lines of its top seller: sneakers. “Our view is that Nike is poised to accelerate sales and margin growth in FY19, which should ultimately support further multiple and stock price appreciation,” wrote Christopher Svezia, a Wedbush analyst. Svezia raised his 12-month price target to $US74 per share, while maintaining his “Outperform” rating. He Nike will need to demonstrate a few things in order to support his conclusion. Though the company is expected to report declining North American sales in the third quarter, its sales growth should improve next quarter by 1% due to the timing of new products and improvements, he said. Moreover, Nike’s gross margin – the per cent of revenue the company has after factoring in the costs of producing its products – will be propped up by abating FX pressure, a higher average selling price, and a favourable mix of sales coming from direct-to-consumer transactions and distributors, he said. This should turn its gross margins positive for the first time in roughly nine quarters. The company should also see accelerating sales growth in China and Western Europe as the company ramps up “an improving product engine,” Svezia said. The analyst said he has high hopes for the company’s new product releases, such as the Epic React, which will formally launch on February 22. Its core colours sold out within a few hours on both Nike’s and Foot Locker’s websites, he noted. Nike was trading at $US66.46 per share, up 4.65% for the year.